Join us for a free screening of the award-winning documentary The Judge in partnership with the Museum of Boulder. 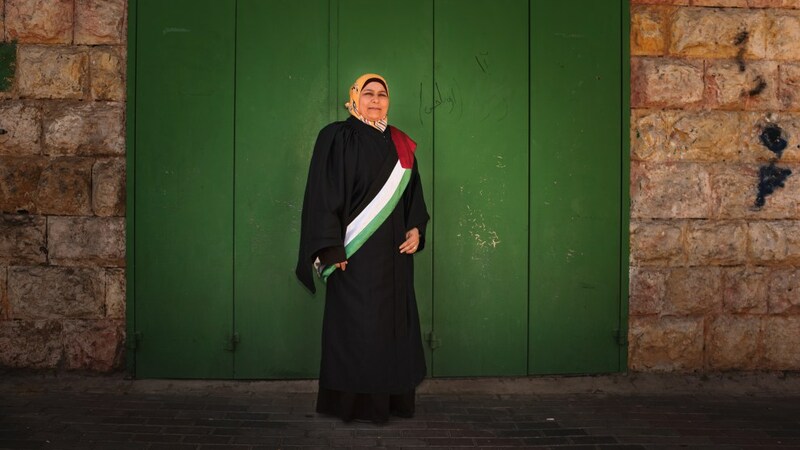 When she was a young lawyer, Kholoud Al-Faqih walked into the office of Palestine’s Chief Justice and announced she wanted to join the bench. He laughed at her. Just a few years later, Kholoud became the first woman judge appointed to the Middle East’s Shari’a courts. Her story offers a unique portrait of Judge Kholoud: her brave journey as a lawyer and her tireless fight for justice for women. The Judge provides rare insight into Shari’a law, an often misunderstood legal framework for Muslims, told through Judge Kholoud’s eyes. The film also illuminates the domestic life of Palestine—custody of children, divorce, abuse—while offering an unvarnished look at life for women and Shari’a. The movie begins at 7pm but join us at 6:15pm for a reception at the Museum (2205 Broadway at Pine, Boulder) with Middle Eastern appetizers (no charge) and beverages available for purchase. You are welcome to remain after the film for discussion (around 8:30pm). We’ll have an array of Palestinian items available for purchase including award-winning olive oil, spice mix Za’atar, handmade embroidered cloths, purses and scarves, khafiyehs, and olive oil soap….all to support refugees and artisans in Palestine. The evening is FREE however donations will graciously be accepted.